Update: A few of my criticisms are actually going to be addressed in future updates. This review was written prior to these updates being announced, and as they are not yet in the game, we will not be updating the review. I’ve been running all over the northern side of the realm trying to solve a mystery. My clothes are tattered. I’m covered in dirt. A mace hangs at my side soaked in blood. I can’t run because I broke both my legs falling down an embankment. My health is slowly ebbing away from the bleeding wounds. I desperately need a place to sleep before I succumb to my injuries. Having arrived in a ransacked town with a regiment of soldiers investigating the atrocity, I assume that they’ll allow me a place to sleep for the night. I wander into a room, find a pile of straw that they call a bed, and rest my eyes for six hours. When I awake, it’s about four in the morning. I hear shouting. I’m not welcome here, and the guards have been called–the soldiers I showed up with. They confront me. I don’t have the coin to pay the fine, so it’s off to jail for me. I sit in a cell for a week and opportunities pass me by. One man ends up dead after I promised I’d take care of some bandits that were after him. A courting opportunity is wasted after she spends days waiting for me to return to her. It was those damned townsfolk that ruined my life. I just wanted to sleep! Time served, I exit the cell a free man. I get my hands on my mace, still crusted with blood, and set my horse galloping towards where I last laid my head to rest. “Historically accurate Skyrim” is a phrase that might not be thrown around officially in Kingdom Come’s marketing, but it’s a fair descriptor that includes both the good and the bad. Kingdom Come: Deliverance is a massive open-world RPG, but it forgoes the dragons and magic to make room for history books instead. There’s a fair amount of argument on just how “real” and historically accurate Kingdom Come is. Small squabbles aside, there’s no denying that it’s rooted far more in the real world than it is in fantasy, and most of the game’s systems take their cues from this idea of being realistic. In a lot of cases that means it’s hard. In many instances that means it’s frustrating. But it also makes even the smallest victories feel rewarding and wholly different from most other game experiences out there. 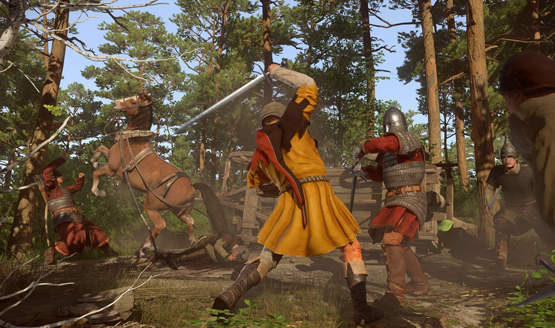 Most of Kingdom Come: Deliverance is a web of fascinating systems where everything matters. The clothes you’re wearing, whether they are dirty or not, the things you say, if there’s blood on your weapon, if you take too much time–everything can make a difference in your quests and interactions. It’s a sandbox where failure doesn’t always mean failure; it just means a different way of doing things. A lot of games might be able to make such claims (go in stealth or guns blazing), but Kingdom Come takes it to another level. Day/night cycles, dynamic weather, and AI that each live their own lives and have different ways of responding to the character based on an enormous number of factors are just some of the details that make up these systems. You might want to take a bath and dress up nice before you talk to the affluent members of society, and donning heavy armor and bloody weapons is a surefire way to intimidate townsfolk and bandits. If you want to undertake training at the combat arena, you’ll have to talk to the commander during the day. At night he’ll be back in his bed sleeping. Every single system in the game plays into how you can succeed or fail in accomplishing tasks, and there are myriad alternate ways to tackle any objective. One of the most prominent of these examples is the quest where you must become a monk to root out a murderer, something I’ve talked about in previous previews of the game. In Kingdom Come, nothing is handed to the player. Skill is earned and everything is a slow burn to heighten the sense of realism that the developer was aiming for. This isn’t the type of game that you sit down and play in small bursts. A significant time investment is required to make forward progress, and the game’s save system plays into this idea. At the time of this writing, saves are only offered at junctures in the main questline, by sleeping in your “home” bed, or by drinking an expensive alcohol such as Saviour Schnapps. It recalls game systems of old that had specific save points, but I found that the limited save system actually discouraged exploration of the open world. The realism of the game makes it far too easy to fail and die while wandering around. It might come from broken legs after tumbling down a small embankment, it could come from getting accosted by bandits while attempting to fast travel (yes, seriously), or it may be a result of exhaustion, hunger, or food poisoning. After more than one instance of attempting to explore off the beaten path and losing hours of discovery, I firmly planted my feet on the game’s “established” path, wary of venturing too far beyond a safe save point. In a massive RPG that presents so many opportunities for exploration and discovery and obviously wants players to step away from the set objectives, the risk is both far too high and rarely worth the rewards that come from that exploration. One of my deaths inevitably came from the game’s tough combat system. Combat is a one-on-one affair; no hacking and slashing your way through crowds of enemies here. Your power is based on your own skill with the complex five-point directional system of attacks and parries and the armor you are wearing, but that can have its own set of drawbacks. Heavy armor may be more defensive, but it reduces movement and, in the case of helmets, visibility. It’s brilliant at times, and frustrating at others, but the worst part of the combat for me came while using a DualShock 4 that is a few years old. A slightly worn out R2 trigger spring means that I can’t quite get a full trigger pull (something that has never given me a problem in any other game), but Kingdom Come’s attacks will only activate when R2 is almost fully depressed. Listless bow strings dropped arrows directly to the ground, and occasional lackluster swings of the sword were all I had until I switched to a newer controller that I was fortunate enough to have lying around. A number of other silly bugs followed me on my journey, most of them visual and harmless in nature. One soldier mounted his horse by standing in the saddle. Clipping tended to be the most common, particularly on weapons and clothing, though I noticed a lot of pop-in for textures and objects in the open world, most often while riding a horse. Occasionally things didn’t function as they should in quests, such as needing to talk to a bailiff whose office door was never unlocked. I tried again and again at various times over the course of three days, knowing that the dynamic day/night cycle played a role, but he never emerged. Finally, frustrated, I picked the lock, got caught, and was fined 60 gold coins which drained my entire savings at the moment. At least it wasn’t jail time. The first time I was tossed into jail was a complete mistake. I had been trying to talk to someone and held down the X button for slightly too long, which changes the talk option to pickpocket. Apparently I had a couple other offenses of exploration taking me into private homes that I shouldn’t have been in and couldn’t pay the enormous fine. The only other choice was to fight or be jailed. I was tossed into jail for nine days which, in real time, took more than ten minutes of waiting for those nine days to tick down. If I thought this was due to some kind of lag or loading, my next ten-day jail sentence proved me wrong. I waited for nearly 15 minutes to get out of jail on that occasion for trying to complete a side mission by knocking a guard unconscious and stealing money from him. Along with striving for realism comes that fact that Kingdom Come’s risks are rarely worth the reward. Instead of simply punishing the character with the removal of gear or money, the player is punished with loss of time. As someone who values his time, hours of lost progress and being forced to sit through 15 minute jail sentences are uninviting and take away any desire that I may have had to take risks and explore my options. 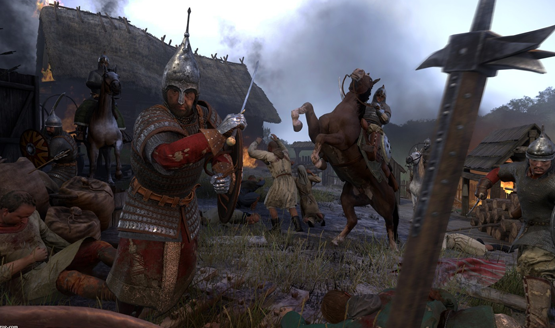 Warhorse has forged a double-edged sword, one where realism serves as both the unique draw and a deterrent. Modern gaming systems are made to respect a player’s time and efforts, balancing the ability to take risks while still offering some kind of punishment for failure. That notion of risk and reward is where Kingdom Come diverges from the likes of Skyrim and other open-world RPGs. The high probability of failure for major risks makes even the smallest victories seem rewarding. Game hunting and shooting my first rabbit while being unskilled with a bow brought a whoop of joy even as I was, moments later, murdered by two bandits that I was unprepared for. In any other game I would be ashamed to have wasted 50 arrows on little more than 10 rabbits, but Kingdom Come made it feel like this was an enormous accomplishment for me. Despite the scope and size of the world and experience, Kingdom Come manages to put a microscope on those small moments and little details. It’s not necessarily about felling swaths of enemy knights (though there is that); it’s about defeating an uppity nobleman in a game-hunting competition with no experience at all and a bow that sways way too much to aim properly. Kingdom Come’s dynamic lighting makes the visuals look incredible. Forests are pitch-black wastelands at night, the star-filled sky is a marvel to behold, and sunrise in Bohemia is a beautiful thing that makes me believe anything is possible. While character animations can be a bit stiff and odd looking at times, the lighting does wonders for skin textures and clothing. The UI is styled after art and architecture of the period, something that offers a deeper immersion as I was jumping into my menu to manage items, skills, and track locations on my map quite a bit. The map in particular is an impressively drawn bit of artwork, mimicking the medieval art style of the era, and changing to varying maps as you zoom in and out of major cities and locations. I was also enamored by the codex, which is essentially a history book. While any other game with a lore codex might teach you about alien races and far-off planets, Kingdom Come’s teaches history. It’s a great way to marry historical accuracy with an interactive experience, and while it’s not required, curious players can gain a lot of knowledge about actual people, places, and things in 15th century Bohemia. Most of the knowledge isn’t required to play the game, but it all provides a context that enriches and rewards the experience, should you decide to dive into the learning side of Kingdom Come. Kingdom Come: Deliverance review code provided by publisher. Version 1.03 reviewed on a standard PS4. For more information on scoring, please read our Review Policy.